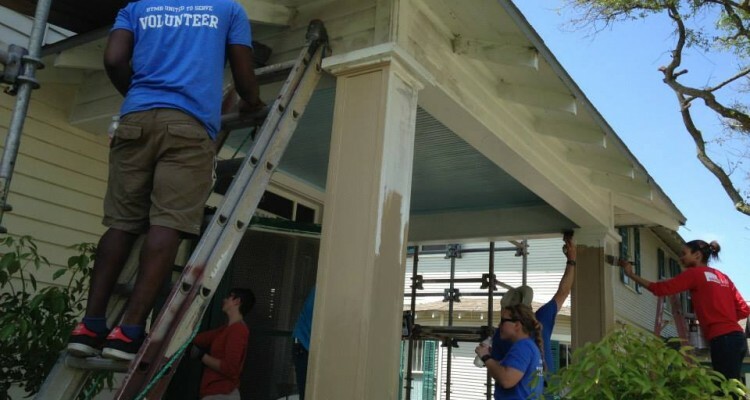 Galveston Historical Foundation invites homeowners to apply to its Paint Pals Program for 2014. Paint Pals offers homeowners a range of assistance options to help apply a protective, exterior coat of paint to their house. To qualify for Paint Pals, recipients must own and reside at the house. “Our primary focus is to assist low-income homeowners improve their house by supplying everything needed for their paint project, including preparation, paint, paint supplies, and volunteers,” says Michael Guillot, GHF Sustainability Coordinator. Paint Pals also welcomes community members interested in volunteering to help houses selected into the program. Projects are typically completed in a single day, and volunteers are asked to commit a minimum of two hours. For more information on the Paint Pals program, please contact Michael Guillot, Sustainability Coordinator, at 409-750-9108, ext. 1306 or michael.guillot@www.galvestonhistory.org.